The Monsieur de Chanel was one of the more surprising watches from Baselworld 2016. A handsome watch overall, it was the company’s first dedicated to men and it is powered by the company’s first in-house mechanical movement too. An instant hit, it was also a sign of more to come. Well, 12 months later, more has arrived. 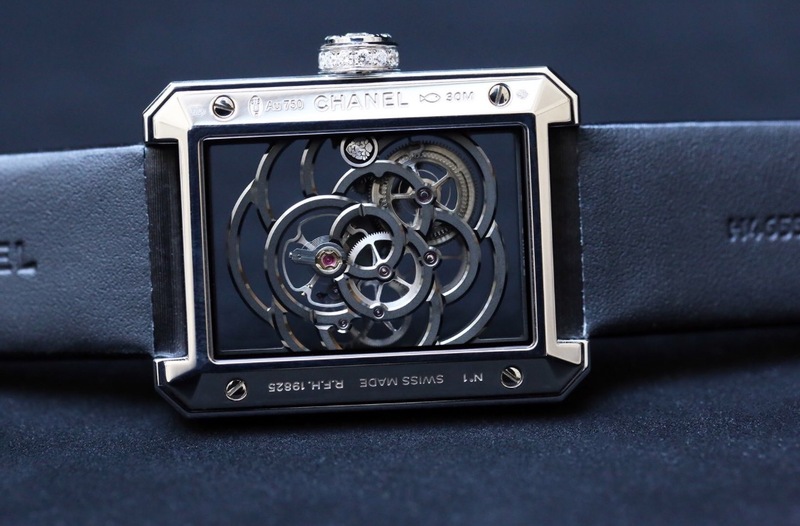 When Chanel unveils its latest range of watches next month at Baselworld, it will be introducing its second in-house movement and this time it will be housed in a ladies’ timepiece, the Première Camélia Skeleton Watch. The Monsieur de Chanel was one of the more surprising watches from Baselworld 2016. A handsome watch overall, it was the company’s first dedicated to men and it was powered by the company’s first in-house mechanical movement too. An instant hit, it was also a sign of more to come. Well, 12 months later, more has arrived. 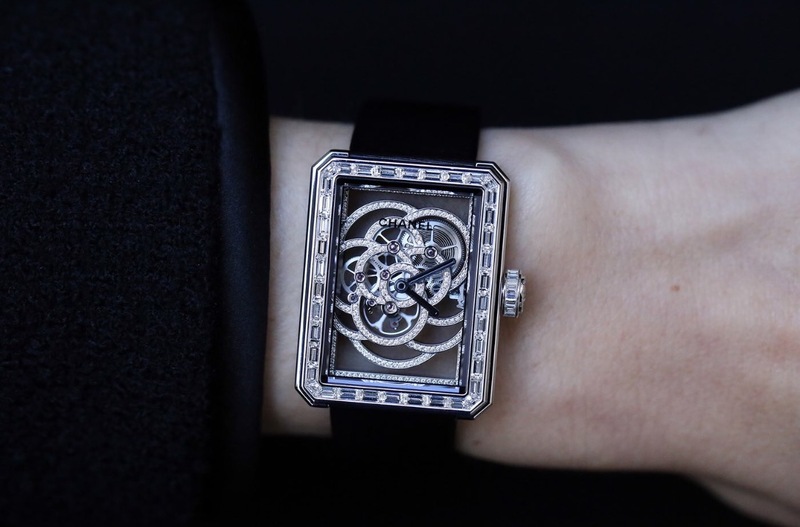 When Chanel unveils its latest range of watches next month at Baselworld, it will be introducing its second in-house movement and this time it will be housed in a ladies’ timepiece, the Première Camélia Skeleton Watch. The Première, as the name suggests, was Chanel’s first wristwatch. Launched in 1987, the case shape was at once original and yet very well known to Chanel – it was inspired by the rectangular bottle stop of the maison’s famous Chanel No. 5 perfume. Paris quickly fell in love with it, and it set the tone for jewelry companies that wanted to diversify their portfolios by creating quartz watches with strong visual identities. 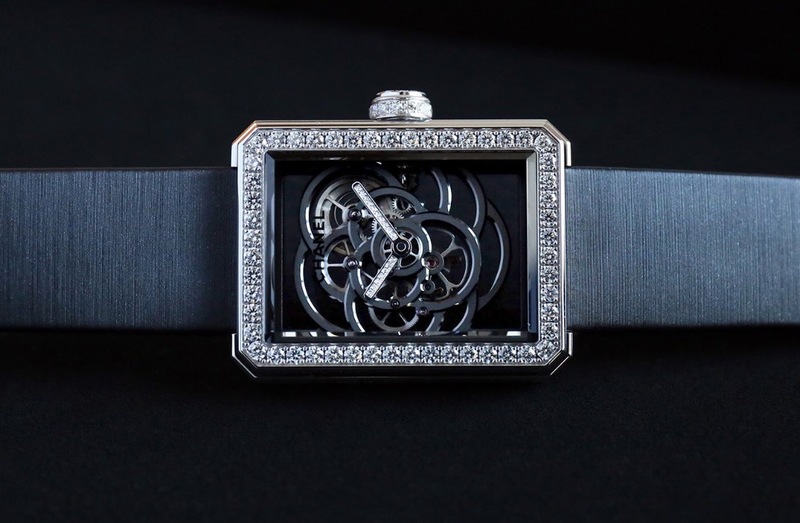 The Première line would later include several high-end mechanical movements, including a flying tourbillon, but this is the first time the watch houses a Chanel movement. And that’s very exciting. This Première measures 28.5 x 37mm and looks very sophisticated. On the wrist, it is difficult to miss – the diamond-set case and crown certainly have their part to play there. There are two basic versions, one with 104 brilliant-cut diamonds and 4 baguette-cut diamonds and another with 42 baguette-cut diamonds and 52 brilliant-cut diamonds. 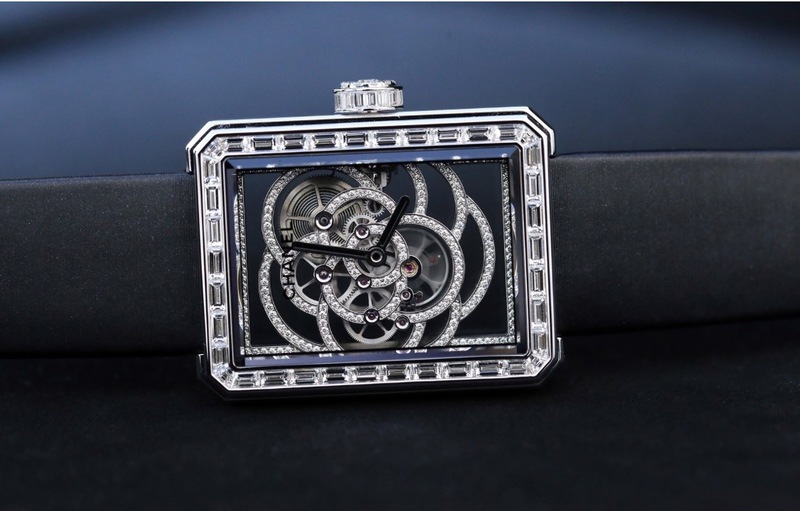 The geometry of the case is absolutely classic, but the construction in two tiers gives it a commanding presence. 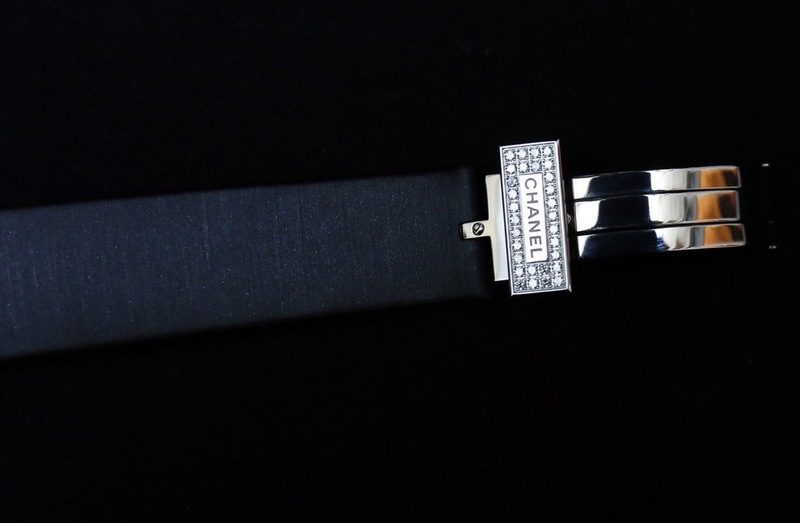 The watch is complimented by a black stain strap with a white gold double folding buckle set with 30 brilliant-cut diamonds. Traditionally, skeleton movements are made by taking a base movement (in-house or not) and shaving off any unnecessary metal until you’re left with the minimum amount of structure the movement can handle before the timekeeping is compromised. But not here. Here, the bridges of Calibre 2, which form a camellia flower, were drawn before any thought was given to the movement’s general architecture. “At Chanel, we put the technical team at the service of the design team. Not the other way around,” says Beau. The camellia was Coco Chanel’s favourite flower, and a source of inspiration for her throughout her career. The flying tourbillon mentioned earlier? Its cage was also in the shape of a camellia. Building up to a skeleton watch, instead of stripping one down is a very interesting approach. 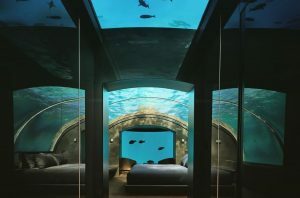 It’s certainly the first time a company has presented the idea to me in this way. The movement Chanel has ended up with is manually-wound (an oscillating mass would have spoiled the see-through properties of the caliber) and packs a 48-hour power reserve. A better view of the movement is offered at the back, where you will see Chanel’s in-house signature, a small lion’s head, near the edge closest to the crown. 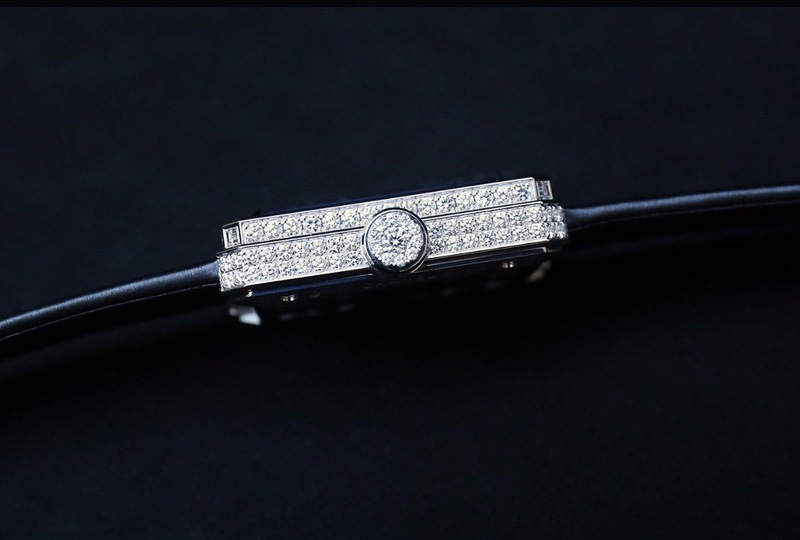 Chanel is presenting two versions of Calibre 2, one with diamonds (paired with the baguette-set case) and one without (paired with the brilliant-set case). In both cases, the bridges are made in white gold – a necessity for the former variation. In the non-set version, they are then coated with ADLC and rhodium plated, offering a little more contrast between the movement and case. If you opt for a diamond-free movement, Chanel offers a bit of compensation by adorning the hour and minute hands with them instead. For the curious, Romain Gauthier was once again involved in this project. The independent watchmaker, who Chanel chose to support several years ago in exchange for his expertise, was involved in developing Calibre 1, and once again has provided the new movement’s wheels. However, the movement was designed by Chanel’s studio in Paris and is brought together by a small team at the Swiss manufacturer Chatelain. Where there exists an intimate link between the movement and the case of the Monsieur de Chanel – the two were conceived at the same time and for one – Calibre 2 was designed as an independent project. 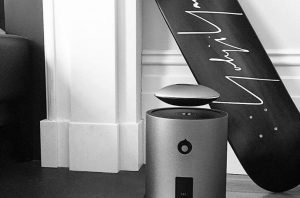 It will be presented in the Première to start, to celebrate the model’s 30th anniversary, but you should expect to see it in other cases in the future. It will also become a base movement for Chanel, on top of which it can add complications. 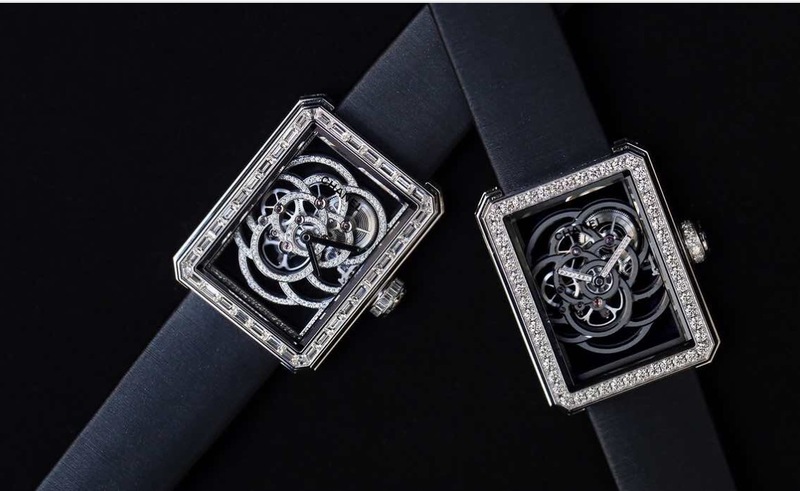 On top of the two versions shown here, Chanel will be offering a limited edition version of the diamond-set Première Camélia Skeleton Watch on a white gold bracelet with full pavé diamond setting. The starting price for the watch is €130,000 (approximately $138,000 at time of publishing) for the brilliant-set model, the baguette-set model will be offered at €190,000 (approximately $200,000) on a satin strap and €260,000 (approximately $276,000) with the full pavé bracelet. 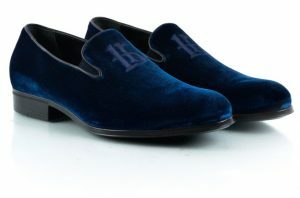 For more information visit Chanel online. Chanel settled on a design that shows the movement within a single coherent visual, the maison's emblematic camellia flower. From the back, you can really see the structure of the Calibre 2. 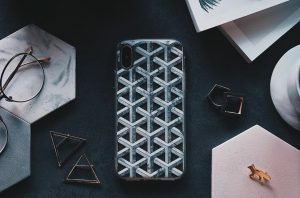 The case has a two-tier construction, with diamonds on both levels. Even the deployant clasp has diamonds on it. On the wrist, the diamond-set skeleton movement really pops.